My name is Brad, and I have been teaching Drama, Film studies and English to high school students in Northern California for the past 27 years. I have been a passionate fan of movies, mysteries and musicals for much longer than that! Follow me on Twitter when my ex-student Alyssa figures out how to cancel the bot that assumed my identity!!!! Hey Brad, we’re just discovering your blog today. As fellow Agatha Christie fanatics, we wanted to: 1) say hello; and 2) invite you to listen to our podcast, All About Agatha (on iTunes or Stitcher: you can click the link on our Twitter profile @allaboutthedame), in which we analyze/critique/adore every single Agatha Christie novel in order of (UK) publication. We even attempt to rank them. (All in good fun.) Hope you get a chance to check it out! Thanks for stopping by, you guys! If I can figure out how to find you, I will definitely give you a listen! Just found your blog. I love it! Can you tell me how I sign up to follow the blog? I think there’s a follow button somewhere on the main page, usually on the right side, Dorothy. I don’t see it because it’s my own blog, but I have followers, so I know it’s there! I love the image at the top, but there’s a few I can’t place!! 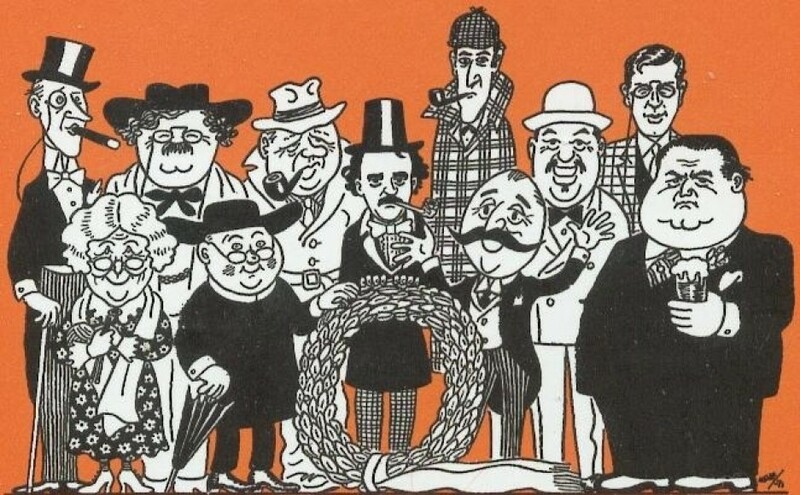 Let’s see: reading from left to right, Lord Peter Wimsey, Miss Marple, Dr. Gideon Fell, Father Brown, Inspector Maigret, Edgar Allen Poe, Sherlock Holmes, Hercule Poirot, Charlie Chan, Ellery Queen and Nero Wolfe! I think that’s correct! Edgar Allen Poe ? But he was an author, not a fictional detective ! Yes, but he was considered a father, if not the Father of the modern detective story. Does he look like someone fictional to you, Santosh? I could be wrong. It does resemble Edgar Allan Poe. Just discovered this wonderful blog, and am excited to see such in depth, perceptive analysis of Agatha Christie. Trying to resist the urge to resurrect too many old posts with comments of my own. One question – what is GAD? Hey, Rick! Thanks for reading! I hope you will look around and comment on things. “GAD” stands for the Golden Age of Detection (of which Christie was queen!) – the period roughly between 1920-1940 when classic detective story authors flourished. Margot pointed the way, and I think you’re going to be an (un)healthy addiction! Alex, I’m . . . honored?!? Brad – Moira passed on Murder at Midyears to me – it’s great fun. I know you were longing to read it and if you’d like me to post it on to you, I’d be happy to. You can contact me via christine@christinepoulson.co.uk. Moira and I were at Bodies from the Library yesterday and were hoping you would manage to get to it one year. WordPress drives me crazy! I wanted to respond to your comment about Christie and artists, but it wouldn’t let me do it there. It’s my understanding that Christie loved artists and theatre people, but you’re so right that they don’t come off at all well in her books. In addition to your list, you can add the self-involved acting couple in After the Funeral, virtually everyone in The Mirror Crack’d from Side to Side, and Robin Upward in Mrs. McGinty’s Dead, who – like so many real life adapters of Christie’s work – didn’t want to stay true to the original characters and stories. Stuart, I’m at the tail end of a production, but I’ll sit down shortly at some point and e-mail. I’d love to have a conversation with you.